Camelottaspots raises quality Bengals and Savannahs. Our kittens are given daily attention to maximize socialization such that the transition from our castle to yours goes as smoothly as possible. 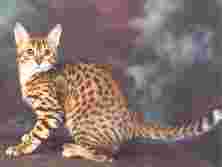 Our Bengals come in brown spotted, brown marble, silver spotted and silver marble.